Our two story home is a fully a equipped home away from home. Its in a safe, family, quiet area of Toronto just 20 minute drive to the downtown core of the city and 15 minutes drive from Pearson International Airport. Enjoy a spacious 2000 sq feet house with free WIFI and Fibe TV (regular TV programing with option to sign in to YOUR Netlix account) TVs in bedrooms offer Netflix . The main floor has a large living area with a Flat 32" TV/DVD, a fireplace, a dinning room with walk out to private deck and fenced in back yard. It has an eat-in full kitchen, a 2 piece powder room and coat closet . The second floor consists of 3 bedrooms and a full spacious 4 piece ceramic bathroom with soaking tub and glass shower. One of the bedrooms is a large master with a 24" flat screen' TV, a queen size bed, dresser, chest of drawers and closet. The second bedroom has a queen size bed with a dresser , flat screen 24" TV and closet and the third bedroom has a double bed, desk and flat screen 24" TV and closet . The lower level has a separate second master suite with a large bedroom with a Queen size bed and a sitting area with a double sofa bed , 32'" TV, a 3 piece bathroom with glass shower, in addition to the laundry room. Enjoy fast unlimited WIFI throughout the home. We offer in property private parking for up to 3 cars. Enjoy a meal on our cedar deck in our private quiet backyard. We have central air conditioning and heating and provide all linens per stay. We also provide hairdryers, coffee and tea, some spices and condiments. Walk through nature trail/bicycle path, steps away, to Marie Curtis park and beach on Lake Ontario. Visit the Niagara Region and enjoy our famous ice wines along with sightseeing The Niagara Falls, Fallsview Casino,Shaw Festival at Stratford or spend a day skiing at Blue Mountain or Hidden Valley. Easy drive up to Canada's Wonderland amusement park, Wet'N'Wild park , Toronto Exibition and ski at Blue Mountain in Collingwood 1hr away (there are a few local ski hills within minutes). If you do not want to worry about Toronto's traffic or parking, then leave the car at home , walk to the 'GO' commuter train station (less than 1KM/half a Mile) and you will be in the central downtown core in 15 minutes. Our location is very convenient due to hwys and public transit takes you anywhere in the Greater Toronto Area, Mississauga and Oakville. We regret that we DO NOT allow PETS or SMOKING in the home. We regret that we DO NOT allow HOUSE PARTIES/EVENTS without previous owner written consent. ALL OUR BASIC RATES INCLUDE ALL TAX, LINENS AND DEPARTURE CLEANING. 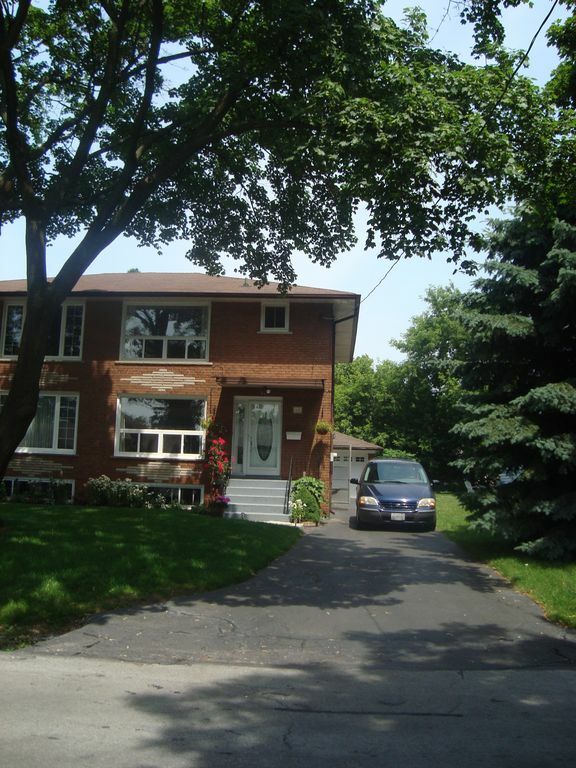 Keywords: Four bedroom house in a very quiet, safe, residential, family area in Toronto's south Etobicoke area. 10 minutes from airport and 15 minutes to the downtown core by car or commuter transit 'GO', Walk to public transit and drive minutes to Highways . Close to Sherway Gardens Shopping Center, Cloverdale Mall, Dixie Outlet Mall , Square One in Mississauga, other local shops, dining and movie theaters. Minutes to prestigious Lakeview and other Toronto and Oakville golf courses. We are travellers ourselves. we have rented many times from VRBO and were not ever disapointed. The people were honest and did their best to make us comfortable. Usually we visit different places every year and always try to rent a place that we can do our 'thing' at our' own time' without the stress of lining up and waiting for meals at a restaurant everyday of our vacation. We like the non crowded atmosphere, nature around us and the privacy involved renting a house. We love this area of the city. Its a family area very quiet with great neighbours. We feel we are in a little village instead of a big city as Toronto. Our children grew up in this area. One has gotten married and chose to buy a house in this area because they love the athomosphere. We like to include in our rental some essentials. To carry on the experience of renting other peoples homes we came across one home in Hawaii that welcomed their guests by providing coffee, tea, sugar, salt and pepper. The house had paper towels and toilet paper. Essentials that we need, however we do not need to buy for the endurance of our holiday and in most house rentals is not included. 2 piece powder room on main floor Full bathroom on 2nd level with large sink soaker tub and glass shower. Lower level bathroom 3pc with glass shower Towels are supplied along with hairdryers and shampoo and Gel. Excellent, clean and well located property on a quiet street. This house was the perfect companion for pur family of five. Clean and cozy. It is close to downtown for driving, close to the GO train and close to groceries. Teresa was super responsive to all inquiries and I am certain, if we had issues, she would have been available to assist us. I don't expect that we will go to Toronto again anytime soon but if we do, we will stay here again. Thank you so much for your kind words. It was a pleasure having your family staying in our home. You and yours will be welcomed by us anytime you come back to Toronto. Thank you for your review. It was a pleasure having your family stay with us. Keep us in mind for any future visits we will love to have you stay with us. 5 of us, ages 23-60, stayed in this home for 3 nights for a family wedding. Teresa communicated with us frequently and made us feel very welcome. The house was clean and large enough where we all had enough space without feeling cramped. We spent a lot of time on the private covered deck off the dining room. The kitchen was well stocked with many items and had lots of storage. Although the master bathroom was small it had lots of nooks and crannies for storing our toiletries so they weren't in the way. We would definitely return to this property if we visited the Toronto area again! Thank you so much for your review. It was our pleasure having you and your family stay in our home. Please visit us again. The house was clean, well furnished, much larger than it looked, and had everything we needed to make this vacation great. It's right down the street from a couple of good eating spots (Woody's Burgers is VERY highly recommended) as well as a major roadway to take you into the heart of Toronto. I car is very helpful, but Uber is also available to make getting around easy. The yard in the back was perfect for grilling and relaxing, and the 4 bedrooms provided plenty of sleeping space. Newer TVs with HDMI were provided in most of the rooms, which made streaming and watching Game of Thrones easy through the included WiFi. Teresa is also very attentive, and checked a couple of times to make sure that we had everything that we need. I can't recommend this place enough. Thank you for your words. It is always a pleasure when our guests enjoy themselves. We stayed here for 4 days and enjoyed every minute of it. Teresa, the owner, is a wonderful and friendly person. The neighborhood is quiet and in a great location. The Go train is within walking distance. Super easy to get to downtown and to the Blue Jays games! We did not have a car, Everything you would need is within walking distance. The home is spacious and clean. We will definitely consider staying here again in the future. Thank you Teresa. This house is in a quiet residential neighborhood. Conveniently located close to highways and within short driving distance to shops and restaurants. House is well maintained, clean and is fully furnished. Kitchen is well stocked with daily necessities like salt and pepper and paper towels. This place is perfect for a family looking for safe comfortable accommodation. The owner Teresa is helpful in every way from making my reservation till my departure. Thank yo for choosing to stay with us. It was a pleasure having you and your family stay in our home. Please keep us in mind on any future visits to Toronto. Drive minutes to local ski hills, 1hr to Blue mountain ski resort in Collingwood. Drive minutes to two main golf courses. Walk to local community center and park (1KM) where you can find public swimming indoor pool, library and tennis courts/skating ring (winter only). Walk through nature trail/bicycle path to Marie Curtis park and beach on Lake Ontario. Convenient drive minutes to Mississauga, Burlington, Hamilton, Oakville and one hour from Niagara Region directly on Hwy near home. Rates reflect maximum of 8 people. Extra premium for holiday weekends. Monthly rate rentals available low season only Please inquire directly for details on non listed special rates. Our rates include tax and departure cleaning. Extra cleaning can be arranged at $100.